It is recommended that you have a Bentley shop manual to reference during this procedure as it has instructions on removing the front grill. These instructions are based upon the installation of the smoked (tinted) European-spec headlights in my 1995 Jetta III GL OBD I car. This document is meant as a guide to help install the e-codes for someone who is comfortable and skilled to work on their own car. As always, it is best to test fit and 'eye-ball' everything so there will not be any surprises during the installation. 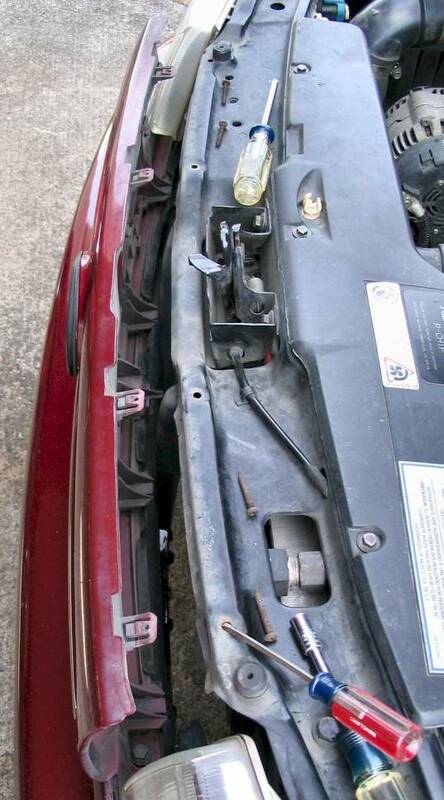 Though this documentation focuses on the left side of the installation it should be noted that the right side is the same procedure except where noted, mainly, the partial removal of the radiator support. It is recommended that the left side be done first since it is the easier of the two (relatively speaking). Start by removing the front grill. I recommend reading section 66-1 in the Bentley shop manual. Below are some helpful pictures for those with a grill like mine. Use a small screwdriver in the screw hole to gently push the upper retaining hooks down as you pull on the upper grill. Bottom view of the lower hooks. When the Bentley tells you to lift the grill, you are separating these hooks from their bumper lip.